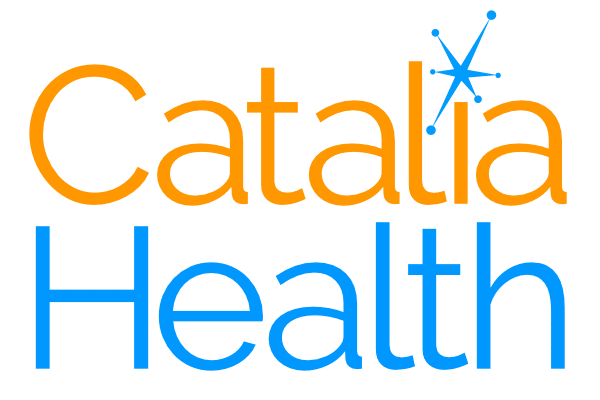 I started Catalia Health in mid-2014 to continue the work at the intersection of healthcare and technology that I’ve been focused on for the better part of two decades. The goal of all of this work has always been to take cutting-edge technology and apply it to the challenges of healthcare in a way that can benefit a large number of people. For some brief background, in 2001 I left my research position at Georgia Tech (where I was building technology for home-based care with an excellent group of colleagues in the context of the Aware Home Research Initiative) to start grad school at the MIT Media Lab. I joined a recently-hired, but not-yet-started faculty member, Dr. Cynthia Breazeal, as the first student in her new lab that we called the Robotic Life Group. Over the first two years there while designing and running a series of studies for my MS thesis along with the late Dr. Cliff Nass of Stanford University, I discovered that as compared to interacting with characters on a screen, robots were more effective at engaging people and keeping their attention over time. I then spent the next four and a half years (my Ph.D. work) at the Media Lab and at Boston University Medical Center understanding and developing the early applications of these findings in healthcare. The first set of robots that I built in 2006-7 were built as a weight loss coach to help people who were trying to lose weight. A randomized, controlled medical trial based out of Dr. Caroline Apovian’s Nutrition and Weight Management Clinic at Boston Medical strongly showed the efficacy of this system, which I started to call Autom™ when the New York Times Magazine was featuring it in a cover story on robots. After the Media Lab I started a company to commercialize Autom™ for weight loss along with two cofounders, Bill McCord and Erica Young. That company, Intuitive Automata, was based in Hong Kong and built a great product (you can find a lot about it with a few Google searches), but was definitely too early to the market. The cost of building the system versus what we could sell it for didn’t make for a viable company in the long run and after five enjoyable, challenging, and sometimes frustrating years at making it work, we moved on in 2013. After a lot of time studying the changes in the healthcare industry, improved capabilities for building this kind of technology, and talking with many potential customers, I made the decision in mid-2014 to start a new company. The result, Catalia Health, is the next phase in bringing a technology to market that we know can help a lot of people. After stepping back to consider the core advantages of the type of systems I’ve been building for years, I started Catalia Health to help solve the challenges of patient engagement in chronic disease management. 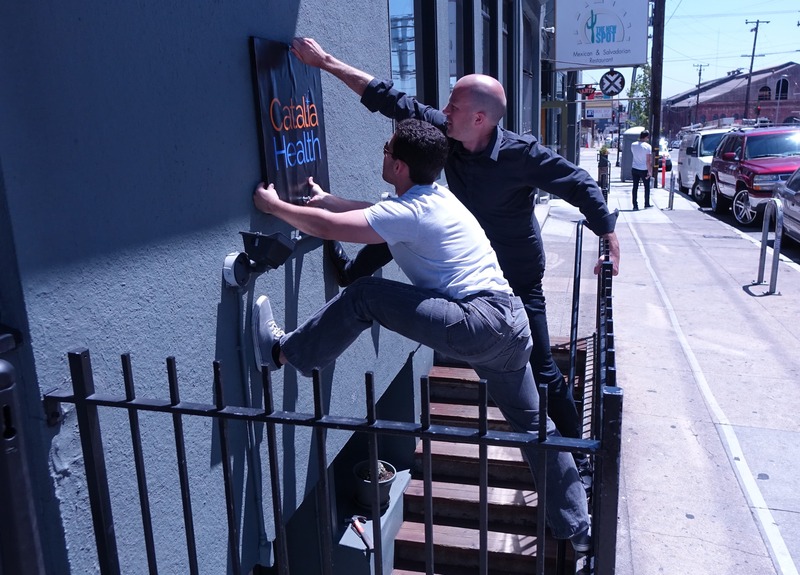 Cory and Kris hang the first Catalia Health sign outside of our office in San Francisco’s Dogpatch neighborhood. What I understood then and now is that this is an enormous problem that many people and companies are working to address. All of us together can continue to make great progress towards taking medical best practices, new treatment programs, and effective medicines and help patients to actually use these treatments in their everyday lives. The reception that we’ve had so far from customers in the pharmaceutical, provider, and patient parts of healthcare has been incredibly positive. We can’t talk in detail about first customers yet, but there will be more news between now and the first roll out of products with patients in early 2016. Enabling all of this to happen are two things: a strong, fun, driven team and committed financial backers. You can see the bios of the team on the home page, but I’m honored to have each of them join me on this adventure of building a new kind of healthcare technology that we know will benefit many patients. If you come back to this blog, you’ll also hear from each of them over the coming months, both about how they’re enabling Catalia Health to deliver our platform and also about their motivations for doing so. As for funding, we’ve had a handful of angels and funds who have believed in the opportunity that we see and our ability to execute on it. Elsewhere on this site is the list of investors and we’ll have another post later today with more details. If you have comments, questions, suggestions, or want to join the growing team at Catalia Health, please reach out. We’ll be checking the comments section here on the blog or you can find me on Twitter at @coryk and via e-mail at coryk at cataliahealth dot com.